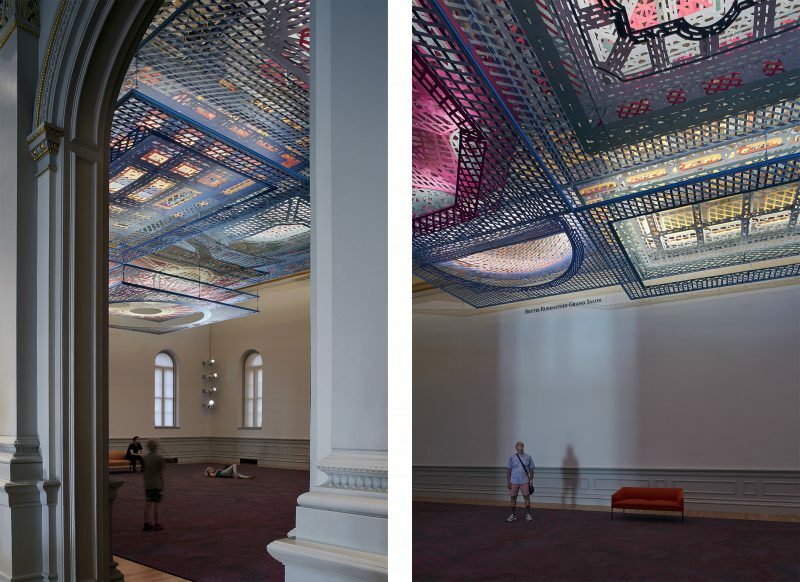 The inaugural ABOVE the Renwick Installation at the Smithsonian is a temporary ceiling hung in the Renwick Gallery’s Grand Salon. If most ceilings imply shelter, defining the limits of the room, others suggest the opposite: extension beyond its concrete limits. The renaissance tradition of Trompe l’oeil ceilings uses the illusionary depth of perspective to project what is not there; a dome that was never built or an attic filled with angels. 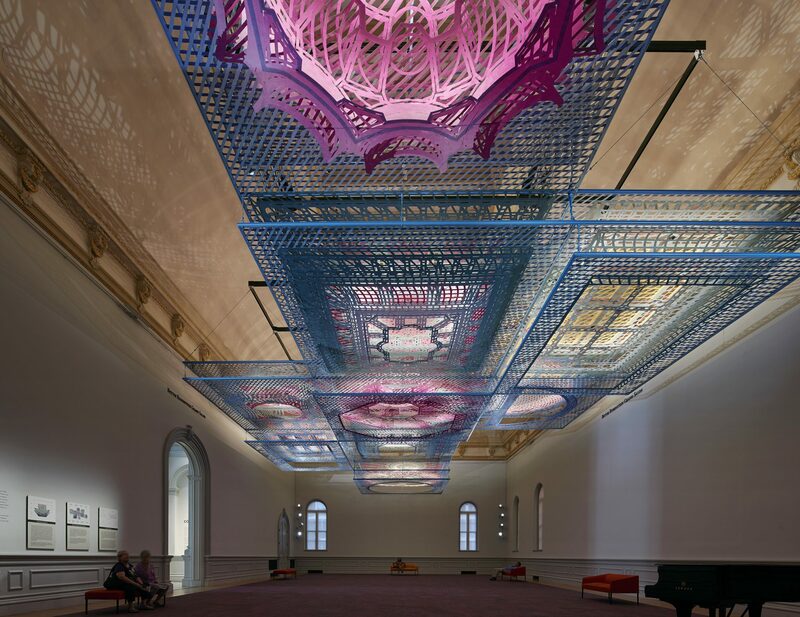 The installation draws out a series of ceilings that project beyond the limits of the gallery, curating stylistically eclectic examples of American architecture loosely contemporaneous with the construction of the Renwick Gallery building in the late 19th Century. This assemblage is a catalog of notable American architectural styles rendered through 21st century technology and visual culture. Trompe l’oeil illusion functions from a single key point – the center of a nave or directly under a dome. 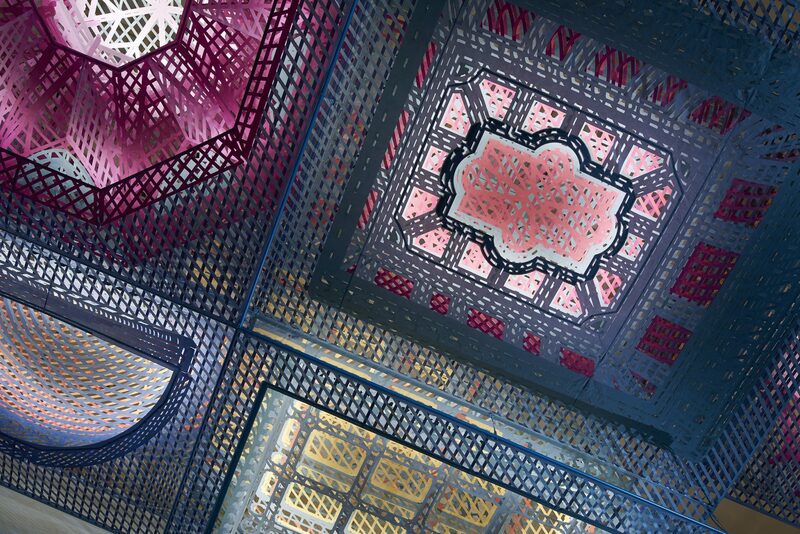 From other points of view, the illusion malfunctions: figures appear suddenly out of scale, space flattens out, or an entire dome seems to change orientation. Given the constant stream of visual illusion we encounter every day, the glitches may now fascinate more than the intended illusion. 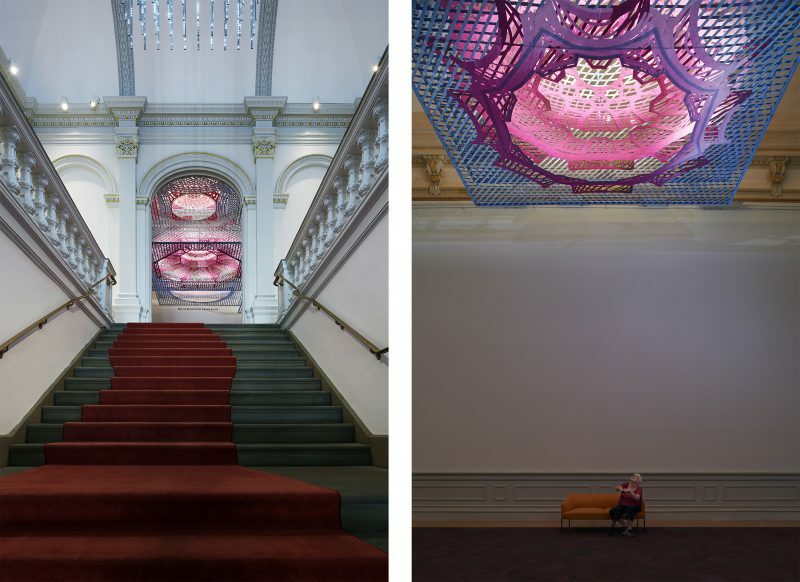 The Renwick installation amplifies and coordinates these gaps, opening up the illusion to creative interpretation and leaving the viewer with a visual puzzle to solve. The relatively low, horizontal expanse of the Grand Salon doesn’t allow for a singular, western version of perspectival illusion. Instead, its proportions are more like a scroll – broad rather than deep, with one scene next to another. The impossibility of a single static point of view led scroll painters in China toward a looser system for describing depth with multiple vanishing points and variable, unpredictable distortion between them. 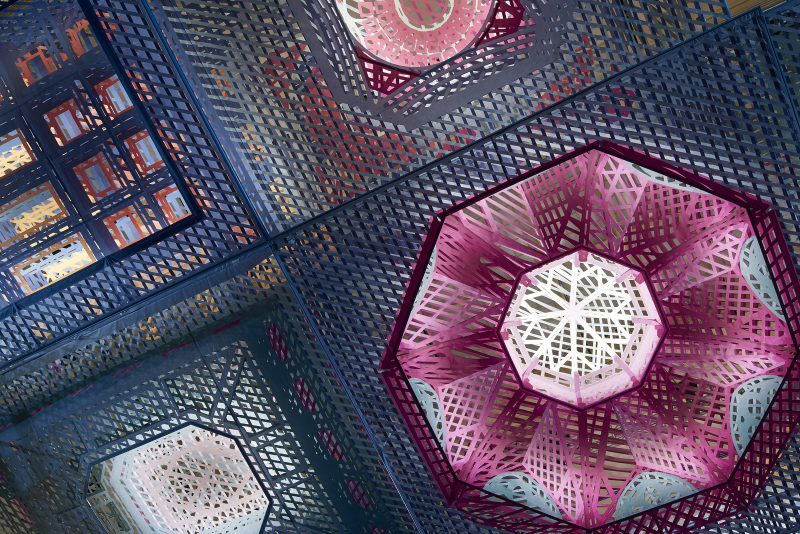 The nine ceilings in the installation are each drawn in perspective from several eccentric viewpoints, creating a series of distinct vantage points to be encountered as one moves through the gallery and zones between where the drawings collide and cohere. The individual drawings are pulled apart onto multiple layers; fractured and allowed to merge into other, possible architectures. The Installation serves as a field guide to American architecture in the late 19th and early 20th Centuries. 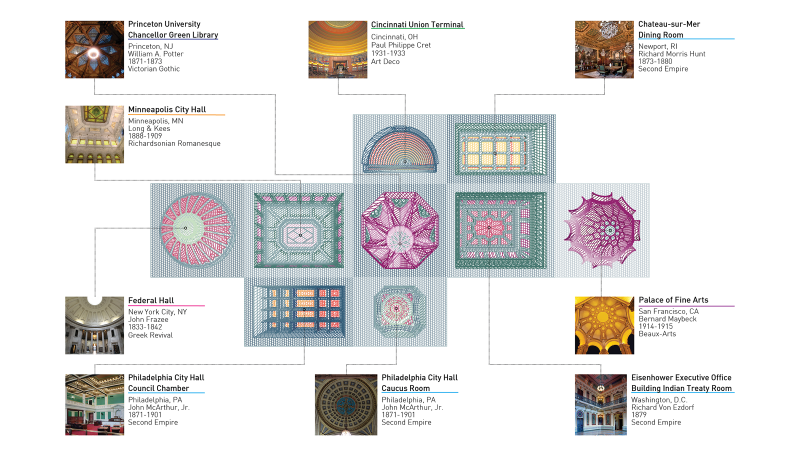 The nine depicted ceilings from across the country include American versions of seven architectural styles: Victorian Gothic, Greek Revival, Beaux Arts, Romanesque, Neoclassical, Art Deco, and Second Empire. Many use a palette of particularly vibrant colors, some newly invented, which we have sampled from.